"My message is the practice of compassion, love and kindness. These things are very useful in our daily life, and also for the whole of human society these practices can be very important. "Basically, universal responsibility is the feeling for other people's suffering just as we feel our own. It is the realization that even our own enemy is motivated by the quest for happiness. We must recognize that all beings want the same thing we want. This is the way to achieve a true understanding, unfettered by artificial consideration. "At the heart of Buddhist philosophy is the notion of compassion for others. It should be noted that the compassion encouraged by Mahayana Buddhism is not the usual love one has for friends or family. The love being advocated here is the kind one can have even for another who has done one harm. Developing a kind heart does not always involve any of the sentimental religiosity normally associated with it. It is not just for people who believe in religions; it is for everyone who considers himself or herself to be a member of the human family, and thus sees things in accordingly large terms. 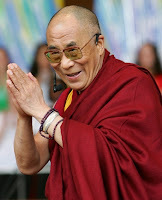 "The rationale for universal compassion is based on the same principle of spiritual democracy. It is the recognition of the fact that every living being has an equal right to and desire for happiness. The true acceptance of the principle of democracy requires that we think and act in terms of the common good. Compassion and universal responsibility require a commitment to personal sacrifice and the neglect of egotistical desires. "I believe our every-day experience confirms that a self-centred attitude towards problems can be destructive not only towards society, but to the individual as well. Selfishness does not solve problems for us, it multiplies them. Accepting responsibility and maintaining respect for other will leave all concerned at peace. This is the essence of Mahayana Buddhism."